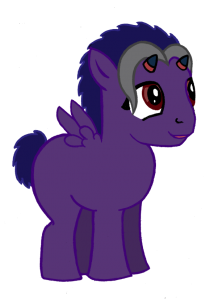 This Sunday sketch is of Yoru, the half-demon boy, as a My Little Pony. With it I complete the task of drawing all Epic Fail’s characters as Ponys. I drew him as a Pegasus because he’s different from all the other characters, and I hadn’t done one yet! He doesn’t have a Cutie Mark yet because he is too young and has not yet discovered his destiny. Look out for Mondays update where I’ll post a picture of all the Ponyized characters together.